Service 28 28A 28B: Changes to this Service with Monday to Saturday Services to operate early morning and late evening Services as Service 28B. During the day services to operate up to every 30 minutes from Royal Parade to Derriford Hospital operating a common Route from Royal Parade to the top of Shallowford Road then from this point Service 28 to operate hourly by Austin Crescent Crownhill to Derriford and Service 28A operating via Mainstone to Derriford. Sunday Services to operate every 2 hours during the day and a little more often in the evening (Plymouth Supported Service). No details of any changes are given on Traveline or by Plymouth Citybus so there may not be a change at all! Slight change of route in Saltash with the Service 5A withdrawn from Barkers Hill (too much vehicle damage) and instead will return to Church Road. Within Plymstock the change is to the two afternoon School day services to Plymstock School which reducines the commitment to one school bus. Monday to Friday journeys during peak times to be adjusted with the 07:17 Service 29A becoming a the 07:12 Service 29 to Derriford Hospital instead. The Service 29A that operated 07:30 from Holly Park to the City Centre will instead operate from Ringmoor way at 08:00. Of course the next batch of timetable changes comes at the end of August as already detailed here The big change seems to be the combining of the 12 with the 42 which is extended to Tavistock every half hour. This also means most services going via Mutley Plain rather than Milehouse. I am sure it wont be long before full details are published. A weekly round-up of London’s rail transport news… Bombardier, CAF, Hitachi and Siemens have been shortlisted for a contract to supply 39 four-car ‘metro-style’ electric multiple-units for London Overground. Timetable for a bus route to an abandoned village Although it runs just once a year, and relies on heritage Routemaster buses, the service to the empty village of Imber is an official bus route, registered as bus route 23A. NOT A GOOD DAY FOR STEAM Having started a lineside fire north of Leeds whilst working Railway Touring Company's The Wizard Express II, 1Z57, 0650 Manchester Victoria to York, 5972 Hogwarts Castle (aka Olton Hall), which had taken over the train at Carnforth, was pulled up and instructions given by Network Rail that the train had to be diesel worked Work begins on new £48 million Bolton Interchange "It’ll deal with the real problems we currently have with the number of people trying to get the train to Manchester, and as we’re developing office space on the area we’re expecting a lot of people to start coming to Bolton for work. Crossrail Franchise Awarded to MTR The £1.4bn contract to run the new Crossrail franchise through London from 2018 has been awarded to Hong Kong-based MTR Corporation, Transport for London (TfL) has announced. MTR was one of four companies short-listed to bid for the contract late last year. SPEED RESTRICTIONS FOR LONDON'S BUSES The Intelligent Speed Adaptation, or ISA, will be used on buses for the first time on UK streets and it is hoped that due to their size the buses will also be able to prevent other vehicles from breaking the speed limit. Council check: Staffordshire We have good maps, although an index for those unfamiliar with the area would help. Timetables are similarly easy to find, but fares information is the big let down. re You Sure? ... erm? ... at Shoreham? And there was plenty of public transport information available at the stop. But ... (there is often a "but") Firstly, look at the "flag". A mixed bag of News He stressed that financial pressures and increased competition meant the company was unable to survive. “We are very sorry that the company has come to an end in this way. The customers and staff have been brilliant and it's been a pleasure serving the people of Hampshire. But there are too many bus operators and not enough work to go round." The Sogginess of Steyning, but not Quite Stagecoach seemed to be running their prestigious 700 service to an arbitrary timetable bearing little relationship to the printed word! Under these circumstances the real time screen might be seen to be helpful. But if the service is so daftly disrupted as shown above, how does even the real time information help? The Sogginess of Steyning : a Delightful Excursion Once again, a simple bus ride produces much to interest the passenger. The fbbs managed to commandeer top deck front and on outward and return journey found much to amuse and entertain. Even Mrs fbb enjoyed the ride, despite the sogginess. 572: Plymouth - Polperro The 572 connects the city of Plymouth with two of Cornwall's prettiest seaside resorts. It runs every hour Monday to Saturday daytimes with a few journeys on Sunday daytimes. There's a New Kid In Town: Part 1 The latest bus model to embrace the London Bus Scene is Optare's new single decker, the Metrocity. RATP Group are the first to purchase these and have a total of 17 Metrocities in their fleet. End of the road for Velvet: All routes cancelled Velvet have ceased trading as of today. Their buses are off the road for good.Velvet was always well respected and it is sad to see them go. Almost all Velvet routes rehomed / Bluestar to Marwell Zoo Following yesterday's shock news that Velvet have closed down, the other operators in our region have been working very quickly to make sure that none of Velvet's passengers will be left stranded. Velvet revolution: Buses back on the road thanks to mystery buyer Velvet has been bought out of receivership and its buses are back on the road. It's not yet been confirmed who the new owners are. Darlington & Durham Despite nearly forty years of photography I've hardly ever seen the north east, something I was determined to put right this year so while Mrs.McCaffery was stalking Barry Manilow across the country I decided on an escape to Scotland via unfamiliar places. The change to the 45 seems to be the 0705 from Royal Parade now departs at 0710. During school days, since April, this run has been operated by a decker that then goes onto a 36 then short 42s for the rest of the day. When schools are back in September if you don't mind getting up early that 0705 trip on the 45 in a decker is good fun!! Really? If this is the case, why are they changing the network in some form or another every 8 weeks? That to me shows poor forward planning, that things need to be revisited this often. It is not the norm for networks to alter that frequently. Does that mean the end of the blue flash ?? 2 x 42's an hour and the 11 hourly ??? Surely they are not going to have 11, 12 and 42 all going to Tavistock ?? That would be an 'over bising' issue surely when you factor in the First 83 and 86 as well ? I believe the 42s are replacing the 12s rather than running at the same time, but then the 12 isnt down as being cancelled so I may be wrong. They may be keeping the 12 for a few runs via Milehouse? Fleet news: R122OFJ is out in swoops with a ramp fitted (I saw it out last week), and they've refurbished all the seats in the same style as the SPDs. R123OFJ is in the paintshop. R125OFJ has again had all seats refurbished in SPD style so I assume that one will be on the list to have a ramp fitted if it hasn't already had one fitted as it's already in the swoop livery so I'd be very surprised if this one doesn't end up with a ramp. I would guess by merging the Tavi route in with the 42 PCB are trying to cover their costs on this route, by taking the customers of the short 42 to Derriford as is, onto the Tavi service. The 12 (Blue Flash) whilst picking up some good loads at times can not be breaking even for PCB after a year in operation I would say so this is move to try and prop it up. I reckon the 42 will be every 15 mins to Derriford then 30 min freq to Tamerton and 30 min to Tavi. the 11 will then change route in Plymouth to operate via Milehouse. The Blue Flash dead and buried. I think First are still in control on this route and PCB will find this change will mean an unreliable 42 on both routes. Maybe some via Whitchurch! Noticed lately the 12 often operated by single deckers possibly reflecting customer numbers here. I think this change will see more PCB customers on the Moor reverting back to First. Maybe, praps another route will gain the Blue Flash Enviro's leaving the 42 in the hands of Citaros, Darts or B7RLE's! 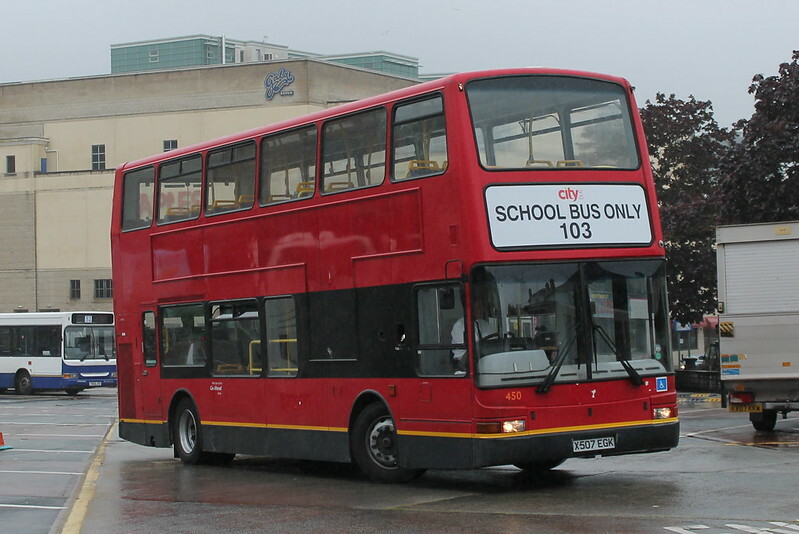 I can't see Citybus wanting to repaint four E400s in which the livery is fairly newish looking! I recall saying at the time Blue Flash was introduced that it would not last, and that it would cost PCB too much in relation to the amount invested. So as the ever eternal pessimist, how depressing it is that my prediction has come true (it is always nice when a pessimist is proved wrong!) and PCB are now going to relocate their expensive double deckers onto a route where they will make some more money. Which is perhaps what a more pragmatic person would have done in the first place. The bottom line will always win out and evidently the amount of changes PCB keep making suggest all is not well. Poor forward planning results in more change than is needed as my experience has told me. Just looked on travel line and I think First should and will be very encouraged by these changes. Yes the competition is still there, but the Blue Flash has gone completely. 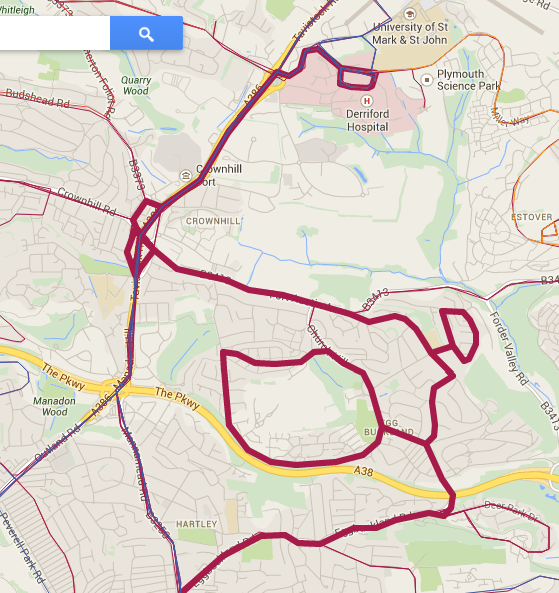 42 to Tavi every 30 mins, no evenings or Sundays, all slow route via Derriford Hospital and Mutley. 11 still says via Mutley although hasn't been updated yet. If you want a quick route as most do from Tavi to Plymouth with no detours and via Milehouse, First have this all to theirselves again...every 30 mins. This appears to be a retreat by Citybus and signs perhaps this route is not paying as well as they would have us believe? Blue Flash cancelled, replaced by 42... this will make not only the Tavistock route but also the Tamerton route unreliable. Well Done Citybus. Massive own goal, First will now finish you off on this route. Journey will be about 15 mins longer with citybus than Firsts 83...a far cry from the blaze of glory a year ago, get from Plymouth to Tavistock in a flash!! First will love this , one major Flagship Citybus route gone in 12 months. Beginning of the end of Citybus in Tavistock I say. How about a Tamerton route for First now as part of the 15 perhaps, could do every 15 mins city - derriford, 2 going Woolwell, 2 going Tamerton? Torpoint next for the citybus axe? I think anyone who was objective would call it stalemate. First has won the battle for Torpoint, and for Tavistock. 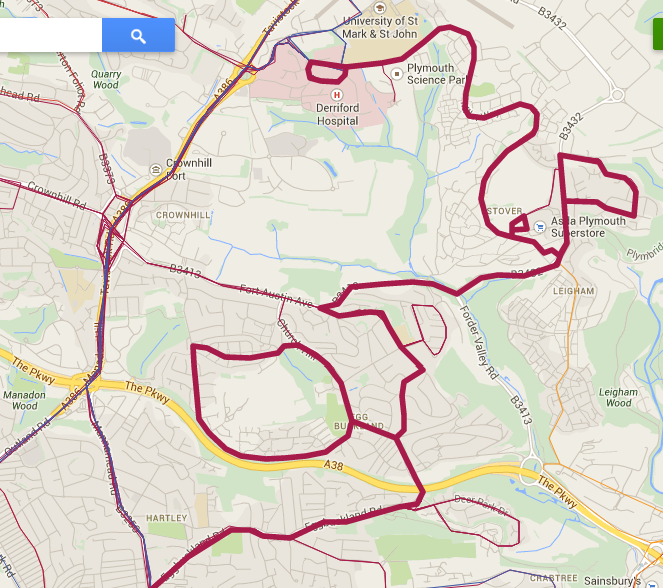 GoAhead are spending a huge amount of money competing on these routes. One the 6 First has taken a huge amount of revenue from GoAhead. I don't think it is stalemate though. Two well resourced companies, competing with a different type of product, carrying loads of people, meaning the competition generates more bus passenger journeys because both firms know that they need to be on top of their game. I assume First will 'rebrand' Plymouth in due course? They can afford to lose money in D&C - the other companies bankroll the loss. gain and often the 45 can be up to 10 mins late. When you have to be at work or make a connection it's not good enough. There was talk of wifi but I have yet to see it. First pulled out and there's no competition. Stagecoach are not competition due to the fares etc. Tavistock get new buses, wifi and a choice between first and Citybus hence maintaining their standard. Perhaps the Citybus management would care to reply and advise why the 45 is so poor now for what is described as an express service in comparison to the 12. Thank you Martyn. The 45 now interworks with the 20/20A. A 20 to Mudge Way on return to the City Centre goes out as a 20A. At Ivybridge, a 20A changes to become an inbound 45, departing the Rail Station at 15 minutes past the hour. Nearly all 45s I've seen on Royal Parade go out as a 42/42A to Tamerton Foliot. On arrival on Royal Parade as a 42/42A, these go back out as a 45. If it's the 45 leaving Royal Parade at 10 past the hour, it returns from Ivybridge as a 45, and goes back out as a 42 then 45 etc. If it's the 45 leaving Royal Parade at 40 minutes past the hour, it returns from Ivybridge as a 20A, then goes back out as 20, then 20A, 45, 42, 45, 20A and so on. A lot of interworking; although ample layover time is provided in all directions. The 20 waits ten minutes at Mudge Way before returning to the City Centre. 7 minutes is provided when a 20/20A arrives on RP before departing as a 20/20A again. 7 minutes is provided at Ivybridge Rail Station before a 20A departs as a 45. When a 45 arrives on Royal Parade, it has fourteen minutes before departing to Tamerton as a 42. When a 42/42A arrives on Royal Parade, they have thirteen minutes before departing as a 45. Living in Plympton, the 20/20A at least is exceptionally reliable. I have however heard of several people saying its the 45 that's late, which makes me think it's the A38 traffic. Plenty of layover time has been put into these services, so on paper at least, I can't see where it goes wrong. No you are being optimisic re Citybus there. The 42 will mirror the 86 route pretty much. There will be no 83 type service at all, unless they reroute the 11. I think they would have to do something with the 11 as if it just does the same route as the 86 AND 42 and offers nothing different, Devon Council would withdraw the funding and this would quickly be loss making for PCB too. This is the beginning of the end for Citybus in Tavistock, I reckon. Everything about the 'Blue Flash' route will be gone. It will become another 45 with older vehicles, slower journey times than First and eventually more expensive too. PCB made a huge mistake taking on First here, as First have nothing to lose and seem to have done quite nicely out of the 6 and 3a, remember they don't have flashy new buses to pay for either. I was in Tavi yesterday when 83 and 12 both came in, not one person out of the 20 plus waiting got on the 12, the 83 had a very decent load when it left. the 86 and 11 I also saw and again the 11 was empty..says it all really. Appears to be the same in Torpoint too with First 81 carrying most passengers and Citybus fresh air west of Tamar. the 12 is being renumbered 42, and is still remaining as blue flash with its current deckers, 3 eclipses are being repainted into blue flash livery too. tamerton renumbered 42a and 42b, the 42a going via southway and 42b going via looseleigh lane as the 42 currently does. 42/42a/42b will be in blue flash livery too. double decks to tavistock, single decks to tamerton. this gives a 15min frequency between city centre and derriford. hope this clears things up. That's more like it, I could almost have dance I have been wanting to see the B7RLE's in Blue Flash ever since it started! I believe the 42A is via Southway and the 42B via Looseleigh Lane. It also means it's a more efficient way of providing a fifteen minute service to Derriford than at present two deckers just doing 'short' runs to Derriford and back. Trouble is it is not exactly a flash route as it takes longer than Firsts service 83 now and is not direct! Excellent information. Will be interesting to see the single decks in flash livery. Are all Tavistock services now to operate via Mutley and Derriford? Doesn't appear to be particularly direct. See people keep saying 'Blue Flash' means getting there quickly etc. yet 'Flash' can mean several things praps that the livery and interior are 'flashy' or 'modern' etc. If it was called 'Rapide Bleu' then that argument would stand! Thanks Anon 18:51. That's actually quite clever - nice one Citybus. I have found the new 11 and 42 timetables on Traveline - southwest and plan a journey from Plymouth to Tavistock for early September. The 42 is as described above; the 11 is via Milehouse. On Sunday the 11 is only Tavistock - Okehampton with Plymouth end being the 42 plus hourly to Tamerton. First will be about 6 minutes quicker during the day. Blue Flash renumbered 42 via Mutley and Derriford Hospital seems a backward step to me by Citybus as they will have slower journey time than First number 83. I can see Citybus loosing customers quite quickly here. Are they changing because the 12 is loosing ,money ? Number 11 will now operate the 'quick route' via milehouse, missing hospital every 1 to 2 hours but also serves Whitchurch, so will seriously slow down this route too. Not sure i follow Citybus tactics here, can only be a money thing as it does not make any sense at all. Something must be wrong at Citybus as they constantly chop and change routes/timetables etc which is awful way to run a bus service surely and really irritates the customers and will drive them to competitor services. First service changes are now on line from Sept 7th. It seems mainly slight cuts to later evening services rather than anything major except the withdrawal of the 4. Torpoint though loose the 81 after 8:30pm. People there will have no service after this time and will need to catch the ferry across to Devonport to catch the 3! Park and Ride extended to 7pm. So, are they keeping the Blue Flash double deckers? I see on the Citybus website they have single deckers in Blue Flash on the way too. Which ones will they be? Guessing the 4 Scania buses? Where do you get this rubbish from???????? I expect First have something in the pipeline which they will obviously keep to themselves until they HAVE to register it. They are not out yet. PCB are obviously going to be full to Cremyll etc. ItIS Summer after all and First had it all their own way until the tenders were lost. A bit odd that PCB dont run on a Sunday though and First numbers are still up where they are running. Personally I think everyone righting First off are well off the mark, I too wouldnt be surprised if they have quite a few tricks up their sleaves yet. Hopefully some new Plymouth routes. How come Citybus have sold some of the Double Deckers they'd already given fleet numbers to? Makes no sense! Giving a vehicle a fleet number doesn't mean it's got a future. I recall a VR which Western National acquired from Thamesway years ago which was never intended to go on the road, but it had a fleet number allocated (1247 comes to mind, but I might be wrong) even though it was never physically carried by the bus. It was done so that as they stripped it for parts each unit could be accounted for and the labour involved in reclaiming the part costed out. Fleet numbers are there for management purposes, not for enthusiasts. due to TFL getting 600 borismasters, they will be an influx of fairly new buses up for grabs. pcb is due to get some newer deckers, though at this time I dont know wot type or wot year. most of the ex london pvl's that we had have gone to ensign to be sold on for further service. 453 is now with velvet southampton. ensign currently have some 09 reg volvo hybrids, ex arriva, for 95k plus vat! Either some more Presidents, or if not Alx400's. If we're lucky we may get some 06/07 Enviro 400s! The 600 Borismasters are over a three year period which goes into 2016. As a proportion of new buses going into London annually it's not going to make any difference whatsover to the availability of newer second-hand stock. Further deckers for PCB may be from elsewhere in Go-Ahead.... I could make a guess but we'll have to wait and see. Interesting conversation on Friday evening. A group of locals who were all under the impression that Citybus actually still is a LOCAL bus company, locally run and funded. They all knew that First is a huge multi national transport organisation, but had not heard of Go Ahead at all. Maybe First should be addressing that. It's surprising how many people don't realise that Plymouth City Bus is no more local than First. It is like so many companies it is just part of a large national company which is answerable to the shareholders. That's exactly what's happening now, the shareholders and the National Board have obviously said they want to see a return on the money they've poured into Plymouth. They were told that First would be forced out and they'd have clear run to charge what they wanted on all the routes. The fact that First hasn't gone away has left them very short on return on their investment so they are now pushing prices up!